As we leave San Gimignano behind it’s towers keep coming back into view as we climb the undulating valley to the South East in bright sunshine. We clamber up and down a couple of steep wooded valleys crossing some streams then climbing up through vineyards, the newly formed clutches of tiny grapes appearing on the vines. There are some significantly sized estates here and many of them provide attractive accommodation for visitors who wish to experience life on a working ‘farm’. 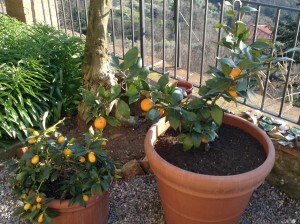 These are called Agriturismi and we stopped at delightful one for a superb cappuccino with a friendly ginger cat. 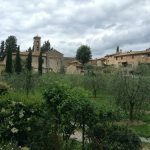 Our next stop was the large town of Colle Val d’Elsa, the old part of town is a place missed by tourists on their way to San Gimignano and therefore is quiet and majestic, well worth a visit to feel the old atmosphere of a Tuscan town dedicated to wine and food. We stay the night here and then leave across cornfields before The Via Francigena then climbed up to a beautiful medieval village called Strove with it’s winding village streets and window boxes and then down to Abbazia di Isola, an ancient Abbey and rest stop for pilgrims so named as it is situated on an island in the poppy filled meadows. It was then easy then to see ahead the white road towards the distinctive castellated crown of Monteriggioni, where we stayed the night near the Piazza in a delightfully spacious and luxurious B&B, with a fine breakfast. This tiny but incredibly busy little place is tranquil in the evening when the tourists seep out of the southern gate to their hotels. There was a crowd of ‘Pilgrims’ leaving the town in the morning. It felt as if we should all be wearing 15th century dress, so quiet in the morning, so perfect a place in it’s time and barely changed in it’s appearance for 600 years. We are now on our final leg to Siena and as we left the gate at the other end of square from which we entered, we descended back into the valley, across a busy road on up the wooded hillside to a lovely small village, La Villa, with a castle…and a house that served it’s own coffee and biscuits to walkers as they passed by their property. This was served in what looked like their lean-to garage but it was delightful and a sure sign of the welcome that people give to people all along this road. The man and his elderly mother kept a record of the travellers that called at their little house over many years a line of walkers from the whole world down their small country lane on their journey to Rome. Another great reason to travel on foot! Through woods and marshland now for while until we climb up a tarmac road to a more suburban landscape and then, first heard by the roar of traffic and then looking out at the main Siena to Florence motorway…and beyond our goal: the slender elegant high tower of Siena’s main square is visible to us all. One more climb up to the main gate of the city and we are there! 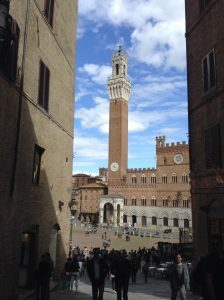 Our friends were in the Piazza del Campo to greet us. We check into our hotel with prosecco on the terrace, eat well and then catch the bus home. All this with a renewed determination to walk the whole stretch of the VF in Italy from San Bernadino to Rome in the next few years. Watch this space and please share your thoughts and comments with us on this Blog. 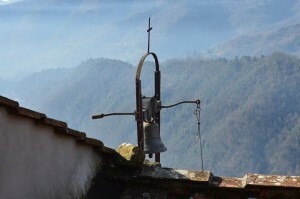 Waking up to Spring, that is the theme for the season here at Casa Verde, and it is also time for us to prepare for our walk along the local part of the Via Francigena from Lucca to Siena soon. 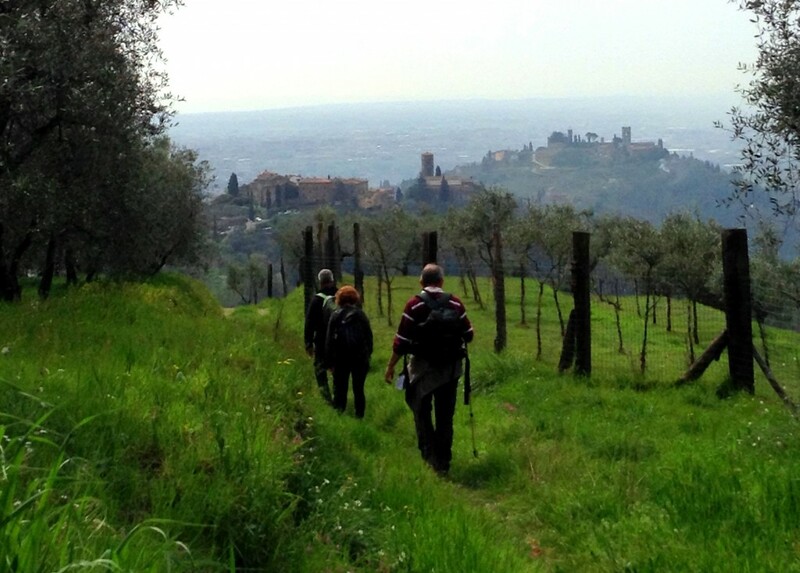 The Via Francigena is the pilgrim’s footpath all the way from Canterbury to St.Peter’s Church in Rome. In AD 990 The Archbishop of Canterbury Sigeric collected his cloak of office by walking with his band to and from Rome! (And he wrote about it). Whether it is the notion of Pilgrimage with it’s spiritual intent, the challenge of the road for days on end and the sense of achievement when you arrive at your destination, or just long days in the ‘wilderness’ attempting discover something more of yourself, then the long walk has great appeal to many thousands of travelers. The Via Francigena through Italy begins at the San Bernadino Pass and goes down the Aosta Valley below Monte Bianco (Mont Blanc) towards Ivrea, the Po plains, Pavia and Piacenza. 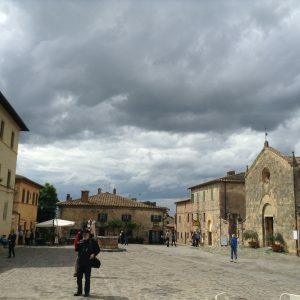 Then over the Appenines to the coast at Luni, down to Lucca, through San Gimignano, Monteriggioni and Siena; crossing Chianti, then Lazio into Rome. It has become an increasing popular walking route but much less well used than the Way of St. James in Northern Spain. 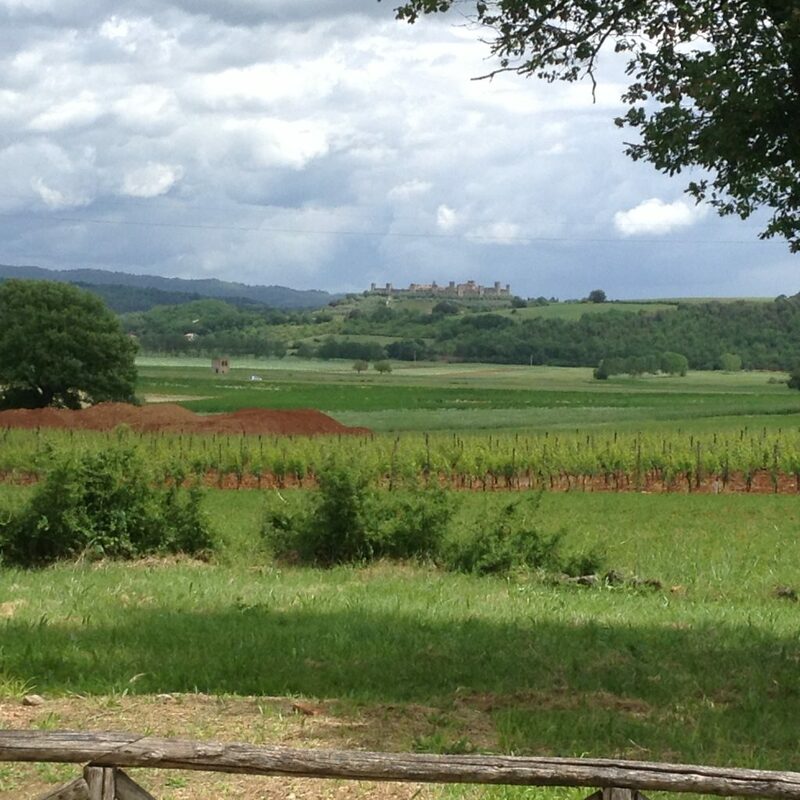 There has been recent publicity to promote the Via Francigena through advertising and celebrations. Also by improving signage; and providing good safe walking through maintaining tracks and by-ways. It is a problem that some of the original route had become busy main roads, and the route has had to be diverted in parts to make it safer to walk. Still there are significant sections on side roads and busy roads in some towns and cities; however the route does have a romantic and ancient history and one which we all hope to enjoy and promote to tourists and keen walkers. Please watch this space in the coming months for pictures and reports of our adventure. It is easy to love Tuscany at this time of the year, when suddenly the temperatures escalate from 12 to 22 degrees centigrade. Within a few days every plant in the garden and in the many folds of the valley comes to life with fresh green leaves, blossoms and flowers. It is as if a magician has swept a wand over the earth and changed it’s colours, it’s smells and it’s air into fans of warm breezes and raised up the volume of the singing birds. 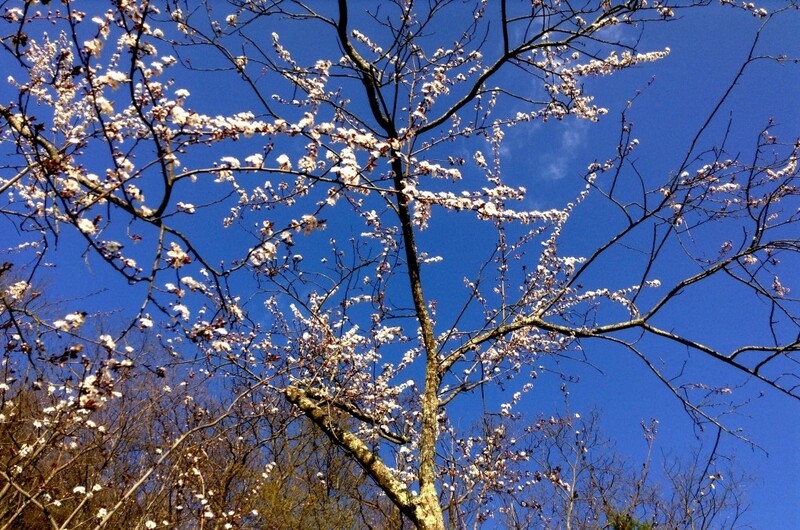 In Britain spring can be beautiful too but it never seems to happens so quickly and with such a force that you feel so transformed by it’s energy. It is the perfect time to explore the hills and valleys of this landscape and we cannot speak too much of the opportunities for walking and for any explorers of life, nature and culture in this part of the world.